During the first few bars of opening track 'Birth of the Economic Hit Man', a creeping wall of familiar ethereal guitar tones, moody riffs and fitful percussion begins to build, about to be danced upon by Anthony Green's unmistakable androgynous wail. 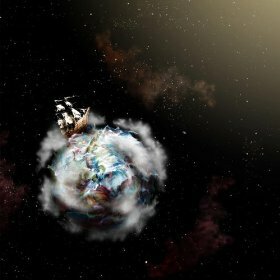 Now on their fourth full-length, it's apparent from this moment right through to the final fade-out of "Violent Waves" that Circa Survive have held on to their ability to surf constantly at the breaking point of anticipation. If anything, their grip has tightened. Having ditched any outside involvement and gone for a total DIY approach, "Violent Waves" is Circa Survive's first self-released effort. This ambitious method landing the production in their own hands has done nothing but make them crash down even harder on a nail they were already hammering the head of, the result being an expansive landscape of tempestuous prog-rock similar to "Juturna" in tone, but blown open to sound absolutely massive. With their trademark delicate, spacey instrumentation and ambient atmospherics running throughout, "Violent Waves" is built confidently on Circa Survive's sonic foundations, acting assertively on its new found freedom from major labels to bring an eclectic stylistic mix, with a combination of tracks like 'Sharp Practice' that lean towards older material, harsher moments like 'The Lottery' featuring Geoff Rickly of Thursday (pour one on the ground) fame providing intricate guitar work and furious percussion, the pulsing pace of 'Phantasmagoria' adopting more of a folksy groove, and more sparse and sombre tracks like 'Think Of Me When They Sound' and 'Brother Song' that wouldn't be out of place on one of Green's solo records. With two sprawling seven-minute epics as bookends, "Violent Waves" can be a pretty dense record to wade through. Or rather, it would be, if every second of it wasn't so outrageously good. Each beat and the pauses between them bristle with emotion without becoming cloying or overdramatic, overwhelming you with the feeling that your soul has goose bumps and can't get rid of them unless you drive for miles to the middle of nowhere just to scream into the dark. Despite their dynamic, rich and seductive sound overall, generally Circa Survive are more of a go-to group during states of loneliness and loss. They make records to accompany night drives, cold walks and pensive downtime. To that end, "Violent Waves" is a brooding masterpiece that comes to a poignant head during closing track 'I'll Find A Way' as Green sings "Nothing feels as good when you're alone". Nothing, that is, except listening to Circa Survive. "Violent Waves" is out on August 28th and can be purchased via Circa Survive's official website.